In my previous post I mentioned that we'd visited the One & Only at the Waterfront for high tea. This was the first time that we'd visited the hotel during the day, so the view from the huge (huge) glass window at Vista Bar was quite different, and more beautiful that I thought it would be. I thought (for some silly reason) that the hotel was a single building, perhaps with a pool and water feature at the back. What I hadn't realised is that the One & Only is built in the shape of a circle around a perfectly-inviting communal swimming pool area (a place where many of the guests appeared to be relaxing) and a beautiful canal, lined with well-kept green vegetation (like the agapanthus that I wrote about previously). 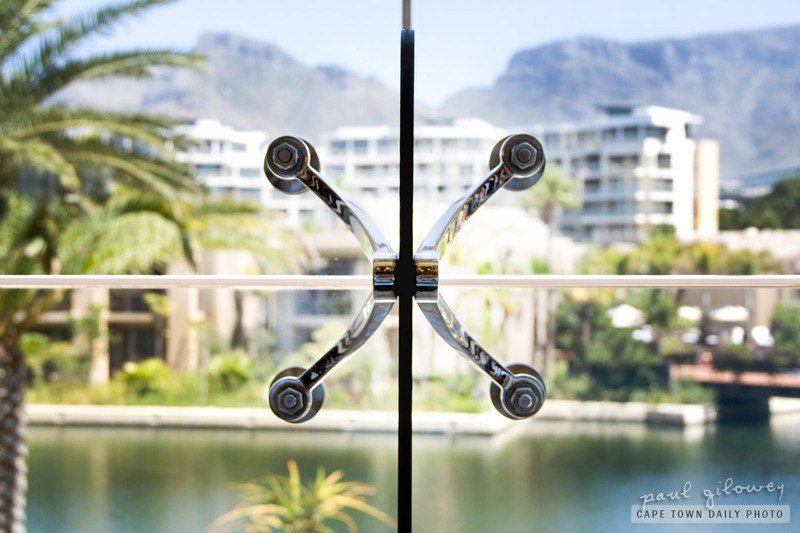 The photo above is of the view from Vista Bar, and specifically of the large metal brackets that keep the huge windows in place. Visit our One & Only album to see a few more photos, including a few taken outside along the canal. Posted in Activities and tagged hotel on Thursday, 6 January, 2011 by Paul. I haven’t been there before, could you post more photos of that place?